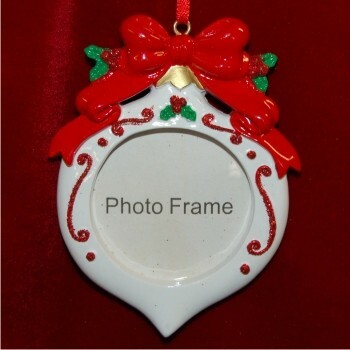 So sweetly charming, this picture frame ornament will brighten any home throughout the holiday season! The red ribbon photo frame personalized Christmas ornament is elegantly styled and colored to be a festive addition to your tree or anywhere you decide to display it using the included cord. A name and the year can be added to these frame ornaments personalized on the back. One of our lettering professionals will handwrite or paint the names in a pretty font to produce a beautiful memento for you or a gift recipient. The "Christmas ornament"-styled photo frame personalized Christmas ornament arrives in our plush and soft velvet drawstring pouch which is ideal for storage too. Christmas gifts Dec 30, 2015 Mary B.